Hive Wash is the first product of its kind to be exclusively manufactured for beekeepers. Its unique formula is the result of 18 months of research, testing and talking to our customers and listening to their feedback. It is easy and safe to use and very cost effective because it comes as a concentrate in a 1 litre bottle that dilutes to make up to 50 litres of cleanser/sanitiser. It is also available diluted ‘ready for use’ in a 500ml trigger spray bottle which can be refilled time after time. Hive Wash has been specifically designed for use in the complete bee environment, poly hives, wooden hives, frames and the honey production area. As all beekeepers know hygiene is so important to all aspects of beekeeping as disease or bacteria can cost a fortune. Hive Wash eliminates all the worry of cross contamination because you can use it on every surface in the hive or honey production area, on tools, equipment and bee wear. It will not degrade the HD Polystyrene and does not leave a residue that could harm bees. When you are concentrating on the task in hand it is very easy to forget the basics of hygiene in animal husbandry. Cross contamination can come from many innocent acts, from changing your shoes to your wellies, from a broom handle to a door handle, from your hand to your money, from your money to someone else’s money and so on. It is virtually impossible to stop infection transfers from one place to another and that emphasises the importance of having a product that can take away the worry of cross infection from you to your workplace and vice versa. Hive Wash is based on a NHS approved formulation used for cleaning in hospitals that kills a multitude of different bacteria, viruses and fungal infections. It is also used in food manufacturing, public buildings and schools where it is the first choice of cleaning professionals. It has been reformulated for use by beekeepers whether hobbyist or professional. Hive Wash is simple to use, just spray on all surfaces and wipe to cover the whole area being cleaned. Leave to dry naturally. The longer the solution is in contact with the surface the more effective it is. It can be used with a mop on floors and the trigger spray gets it into corners and cracks that harbour the most bacteria. A medium stiff brush and total immersion of components for 2 minutes is recommended for Polystyrene hives. 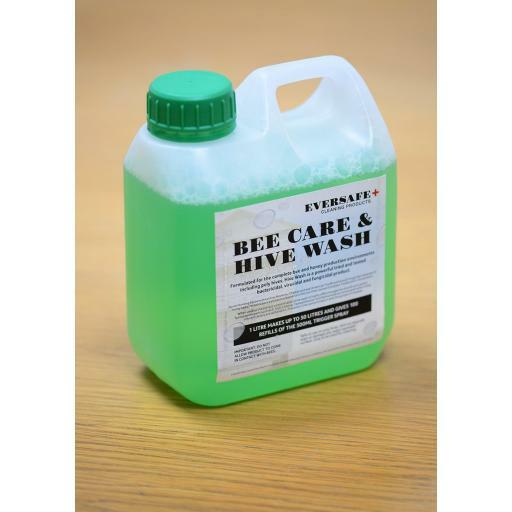 Hive Wash has a very pleasant smell that disappears after a short time and just so it can be identified easily it is coloured with a food grade green dye which does not stain. You can be certain that when your hives are repopulated they will be clean and disease free and that your honey production area will be safe and ready for the liquid gold that is the fabulous reward of beekeeping.